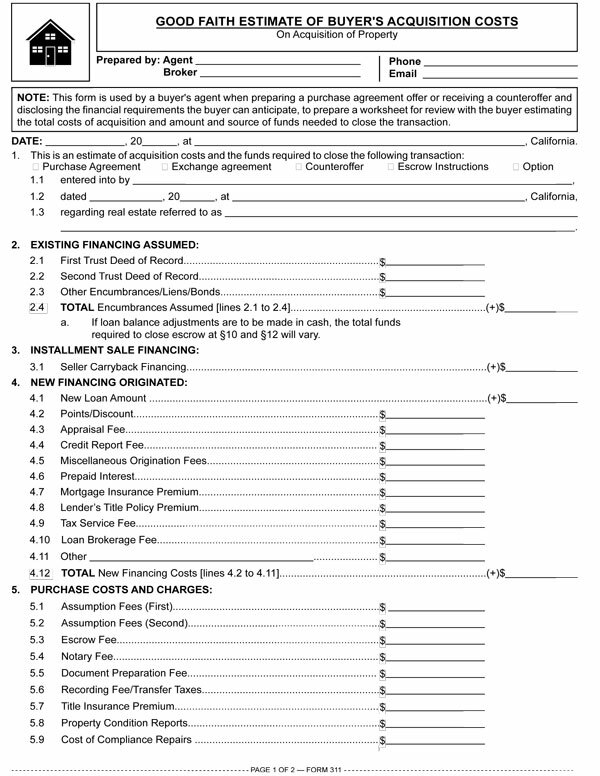 This form is used by a buyer’s agent when preparing a purchase agreement offer or receiving a counteroffer and disclosing the financial requirements the buyer can anticipate, to prepare a worksheet for review with the buyer estimating the total costs of acquisition and amount and source of funds needed to close the transaction. The maximum price a prospective buyer is able to offer for a property is determined by the amount of available funds from all sources which remain after deducting the acquisition costs. Before a cost sheet review with the buyer can go beyond identifying the various sources of cash available to the buyer, the buyer’s agent needs to arrange a meeting for the prospective buyer with a minimum of two mortgage lenders. the amount of upfront nonrecurring acquisition and financing costs will be incurred (and who will pay them). The estimates entered on the form by the buyer’s agent need to be based on concrete information about transaction costs and finance charges both known to them or readily available on an inquiry of others or on minimal investigation. Thus, the figures entered reflect the agent’s honestly held belief that the estimated amount will likely be experienced by the buyer if the buyer acquires the property under consideration.